Not a whole lot going on in TNSAR-ville this last month. Folks have done a good job of staying found and not much in the way of trainings coming up in April. Makes it difficult for a guy to write a newsletter. I've highlighted the Benson Hut Evac Training we had in mid-March and let you know about another team member who needs your help. As a teacher by trade, I followed my instinct to put some knowledge in your brains. I've summarized an interesting story published about a search for an autistic boy in 2011. If you'd rather read the full story, the link is at the botttom of my summary. Scott Meyer put together a training scenario where there was a single avy victim in need of evacuation from the Benson Hut. The team deployed skiers from Coldstream Canyon and Sugar Bowl Ski Resort. The snowmobiles deployed from Coldstream Canyon and Cabin Creek while the snowcat deployed from Cabin Creek. The terrain in this area is complex and getting the necessary equipment and personnel to the victim was not easy. 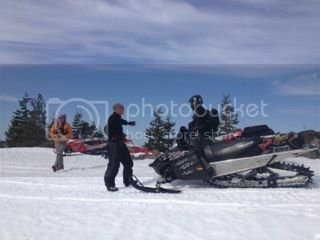 The snowmobiles hauled the two piece Cascade rescue sled the majority of the way and then handed if off to a ski team. It was around mid-day at this point so the team broke for lunch and were regaled with many a tale about the epic searches of yore from a few of the Big Dogs on the team. After lunch the team worked on setting up anchors and lowering the victim/sled in technical terrain. It was a great training for technical skill practice and it was also valuable to see (in daylight) and get familiar with one of the areas our customers frequently enjoy. "Point it in that direction," he said. "I promise you won't get hurt", he said. "That's not the way we get things get done in Liverpool." Snowmobile and ski team member, T.J. Johnson, recently injured both legs in a ski accident. He fractured his tib/fib on one leg (rod inserted) and has an injury to his patella on the other leg. T.J. makes his living climbing trees and blowing snow and will be out of action for several months. Compounding this problem of loss of income, his medical bills are piling up. Just a head's up that the team meeting this Monday, the team will be passing the hat in an effort to help out T.J. with his financial challenges. If you are able to donate to his cause you'd be helping out a long time member who really needs your help right now. In the February newsletter I mentioned an article about lost person behavior published by the National SAR Secretariat in Canada. One of the things mentioned is that it is not uncommon for lost children to hide from searchers. What if that lost child was autistic and non-verbal? How would this change the search? A neurological condition present from early childhood, autism is a series of developmental problems that vary in severity. These problems hinder a child's ability to communicate and interact with others. The Center For Disease Control reports a startling increase in autism cases recently. In 2008, 1 in 188 kids had some form of autism. In 2012, 1 in 78 had some form of autism. The condition affects five times as many boys as girls. In the August 2012 edition of Outside magazine, author Dean King wrote a story about Robert Wood Jr., a six year old autistic boy from Virginia, who had visited the North Anna Battlefield in Virginia's Hanover County in October 2011 with his dad, his dad's girlfriend and his younger brother, who is also autistic. During a brief rest after a mile hike, Robert bolted down a spur trail unnoticed. Within five minutes of his disappearance, Wood's father called 9-1-1 and a search was initiated. Within an hour, two dog teams and two ground teams were deployed. One of the dog teams locked onto a scent and went towards the North Anna River. Many autistic children are obsessed with water and the North Anna River would remain a concern throughout the search. Robert thought he could swim, but in reality, could not. While non-autistic kids will often hide from searchers, they often make themselves known when they become uncomfortable (cold, tired, hungry, etc.). To many autistic kids a search and rescue operation probably looks like a giant hide and seeks game. Because of their autism, many others probably don't even recognize that they're lost. Complicating things for searchers was the fact that Robert doesn't feel pain the way other kids do. He could hurt himself and not complain. Hunger doesn't bother him and he isn't afraid of the dark or being alone. Many of the things that would "flush out" a kid without autism probably weren't going to move Robert. The search was under the command of the local county sheriff for the first 48 hours but after that point, search operations were transferred to the Virginia Department of Emergency Management. One of the resources the state brought to the table was Robert Koester, who wrote the SAR standard, Lost Person Behavior: A Search and Rescue Guide on Where to Look—For Land, Air and Water, which uses 40 categories to create a missing persons profile which can help searchers determine the likelihood of the missing person being alive and where they might be found. While autistic kids may have some identifiable tendencies, they are considered very unpredictable. "When you meet one autistic person, you meet one autistic person." It was determined that if Robert had not drowned in the river he was either hiding or on the move. On Thursday night (about 100 hours into the search), two of the state's top trackers from Appalachian Professional Tracking Group heard something that stopped them dead in their tracks. It was a human sound, "a high guttural noise". The searchers thrashed around the bushes but found nothing. Nonetheless they were convinced they were within yards of Robert. The next morning a local Richmond area man, who insists on remaining anonymous, was reading the paper and saw that the temperatures were forecast to fall and there was a strong chance of rain. He told his wife he was going to go look for the boy. He drove to the volunteer processing center but was too late for the morning's training session. He drove himself to the staging area, parked and followed his gut. Less than a mile from where Robert was last seen, the man walked between an ag field and a quarry. He moved towards the quarry pit and scanned the terrain in front of him. There in a deep gully, lying in the fetal position was Robert. He was cold and scared but, except for his shoes, was still clothed. His hands and feet were discolored and swollen. The insects had had their way with him and his body was covered in dirt, scratches, bruises and cuts. Despite these facts, he was alert and oriented and breathing normally. He was taken by state police helicopter to the hospital where he made a quick recovery. Robert is back at home living with his mother and grandmother and he is now going to school. He and his brother now wear minature transmitters on their ankles . The transmitters send out a signal for up to a mile and can be tracked by law enforcement.